Ever since it was launched, the Happy Sport collection has been an undeniable success. Over the years, it has been enriched with original creations, occasionally offbeat but consistently delightful. 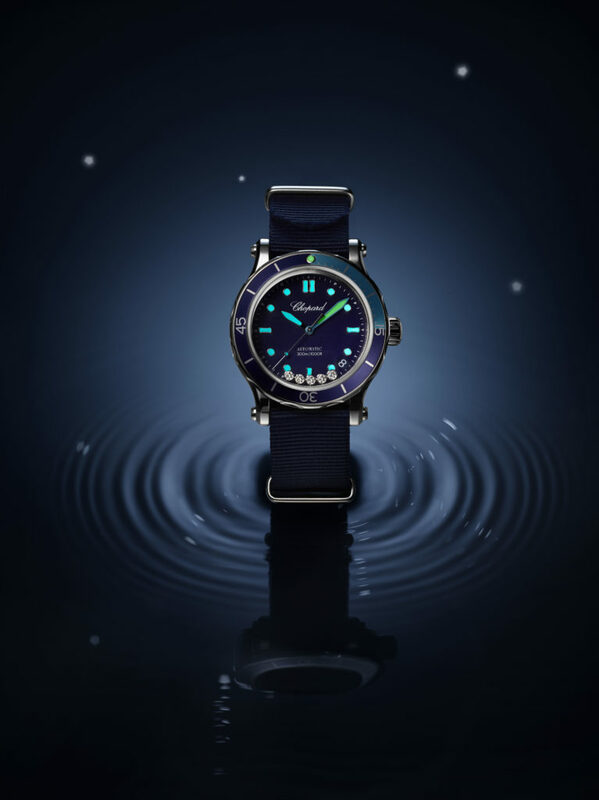 This year, Chopard is once again reinvigorating this iconic collection with the new Happy Ocean. Both sporty and elegant, Happy Ocean is the ideal watch for exploring the ocean floor, relaxing on a yacht or strolling on the sand. As technical as it is fun, it is water-resistant to 300 metres (100 metres for the gemset version) and beats to the rhythm of a self-winding Chopard movement. Happy Ocean focuses on a nautical adventure. Combined with a large 40 mm steel case, the unidirectional rotating bezel with its two-tone blue-turquoise or blue-raspberry colour is inspired by azure blue shades and brightly colored corals, while featuring a wave-shaped design for easier handling under water. The screw-down crown is marked with a C and the case-back is engraved with a wave motif. The intense blue dial brings to mind the ocean depths and is enhanced with a white minutes hand hemmed with blue or raspberry that glows at night or in dark, deep waters. The hour-markers and hours hands also illuminate with a blue hue, with all other indications required for diving in green. 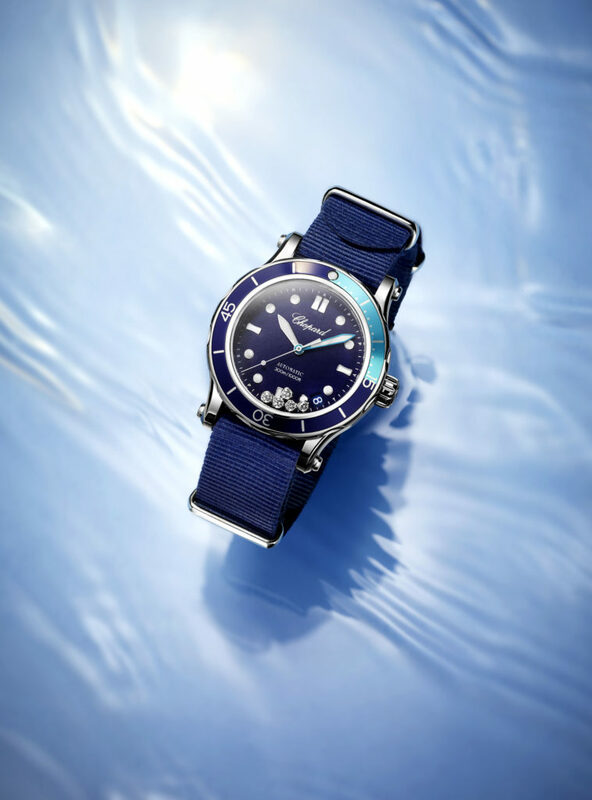 The brightly coloured straps in turquoise or raspberry rubber, adorned with a ripple motif, are designed to withstand the effects of sand and water, as too is the navy blue NATO strap – a first in Chopard’s ladies’ collections – that is supplied with the watch. Happy Ocean also comes in a precious jewellery version. An 18-carat white case, a navy blue mother-of-pearl dial framed by a fixed bezel set with diamonds, sapphires and either rubies or topazes : these new variations endowing the collection with sparkling alternatives are fitted with an alligator leather strap and a NATO strap in the same navy blue shade. 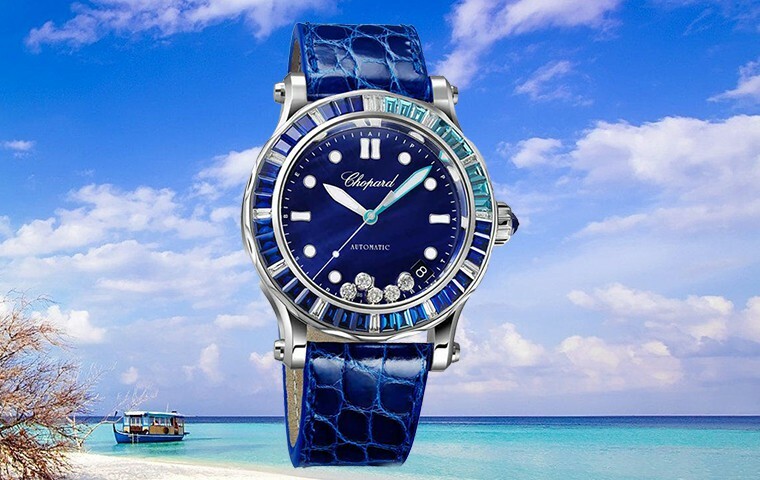 Water-resistant to 300 metres for the polished version and to 100 for the gemset interpretation, the Happy Ocean watch is powered by a self-winding Chopard movement (01.01-C) entirely developed and produced in the workshops of the Maison in Fleurier. 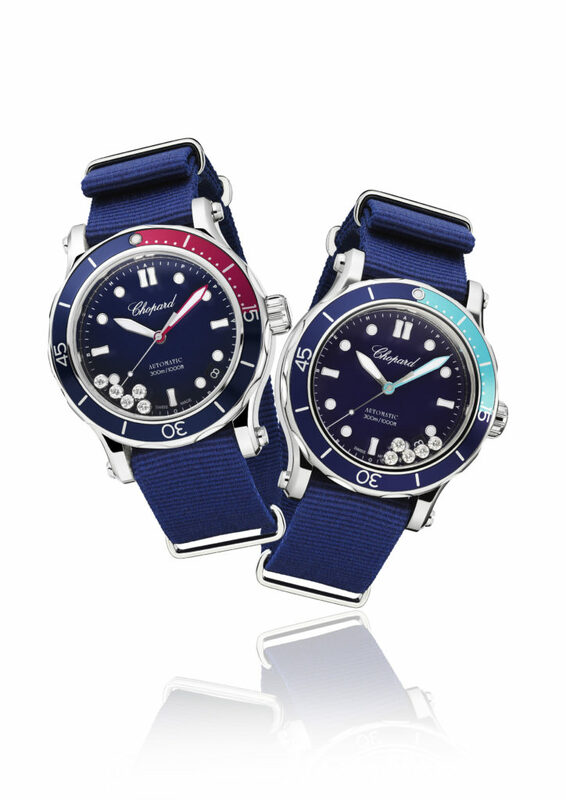 The Chopard Happy Ocean watches can be found in Malta, exclusively available at the Edwards Lowell boutiques in Valletta and St Julian’s.